The pair put the ugly incident behind them. The last time Andrew Gaff and Andrew Brayshaw met on the field was the scandal that rocked the AFL. In the incident in August last year, Gaff punched Brayshaw, setting in motion season-ending ramifications for both players. The 19-year-old first year player Brayshaw suffered a broken jaw and displaced three lower teeth in the incident, which had to be put back and splinted with him unable to eat solid food for four weeks. For Gaff, his season was ended by the eight-week ban he was given, the equal longest of the century. The suspension saw Gaff the most miserable person on the day his team - the West Coast Eagles - won the AFL Grand Final, with the All-Australian suspended for the game. 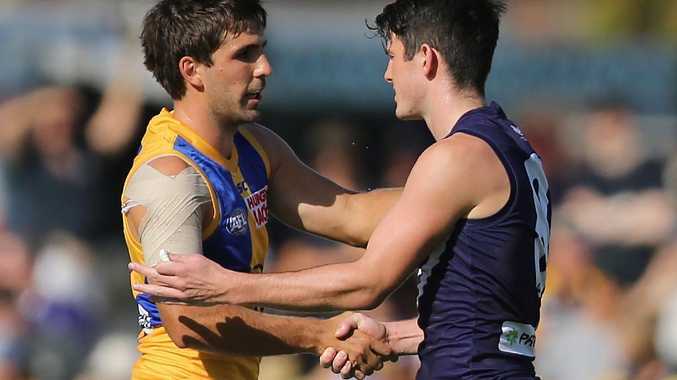 However, the pair met on the field for the first time since the incident as the West Coast played Fremantle in both sides' final game of the pre-season. The Eagles may have won by 51-points but the biggest talking point was the public handshake of the two players. 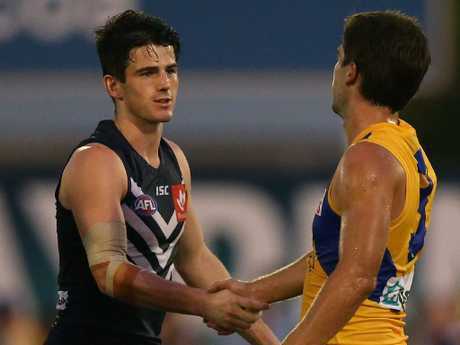 Andrew Brayshaw and Andrew Gaff make peace on the field. 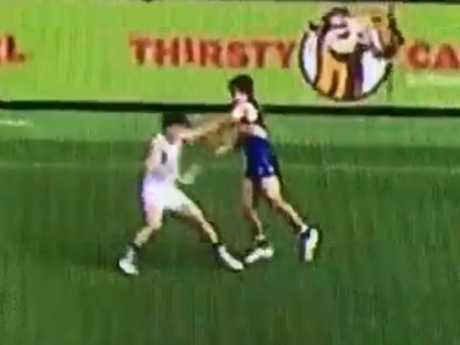 Gaff maintained he was aiming to punch Brayshaw in the chest and missed. At the start of the JLT Cup, Brayshaw said he was eager to put the mess behind him. "I really hope everyone moves on. For me that JLT game will be that last step and then I will be fully moved on and ready to go and I am sure Andrew Gaff will be happy to move on," Brayshaw said in February. "If me and him both want to move on I think everyone should try to. Every game of the AFL season will be streamed on Kayo Sports from just $25 per month for two devices at once on Apple and Telstra TV, for Apple and Google Android smartphones, on web browsers and via Google Chromecast Ultra devices. Click here for your free trial. In the match, Fremantle opened up a 21-point lead late in the first quarter, and still led by 16 points midway through the second term. But West Coast turned the game on its head with nine-straight goals to secure the 16.13 (109) to 8.10 (58) win in front of 8047 fans. The Dockers struggled in the midfield without skipper Nat Fyfe, who is out with an elbow injury, with the Eagles winning the stoppage battle 55-27. Brayshaw continued his strong pre-season with 22 disposals while Gaff had just 16. The ugly incident that rocked the AFL. Eagles coach Adam Simpson said it was good for the star midfielder to get his meeting with Brayshaw out of the way. "I think it was just good to get the game out of the way from both clubs point of view. 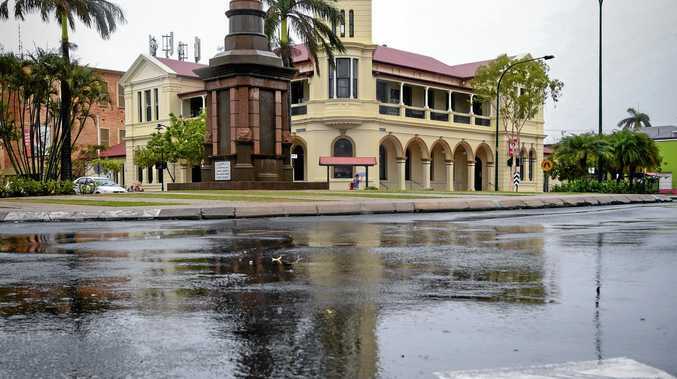 We've all moved on," Simpson said. Fremantle coach Ross Lyon said his team needed to learn from the loss. "I was pleased with the first half, but I didn't seethe third quarter coming," Lyon said. "We got comprehensively beaten around the ball."